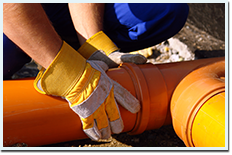 As market leaders in all aspects of residential or commercial restoration we at Clearway Restoration naturally have at our disposal any and all types of water restoration equipment. There are several equipment items commonly used during restoration of property which had suffered some kind of water damage. 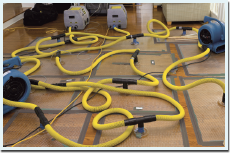 Exactly which piece of equipment will be used at what stage of the restoration process is decided on by our expert team according to the unique characteristics of each water damage restoration job we are faced with. Water damage may occur as a result of flooding (due to heavy rain fall for instance), broken water pipes, burst sewage draining pipes, sewage backups or as a result of fire fighting measures. Whatever the circumstances a large volume of water may have accumulated in certain areas (basements for example). It is essential that such buildups be cleared away quickly since any lingering increases structural damage. Pumps are the main equipment items used in order to drain out the water, at Clearway Restoration we have a wide array of pumps at the ready. Once all the water has been drained out begins the second stage of the restoration process, the thorough drying of any and all materials in the areas affected. Materials which cannot be salvaged are removed and heavy duty fans will be positioned in a way that creates optimal motion of fresh air through the region in need of drying. 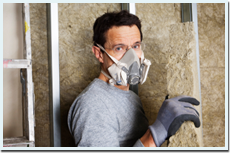 Clearway Restoration’s experts will know how to best use the state of the art fans we own. Another piece of equipment used to remove any water left after pumps were deployed is a wet/dry vacuum. At Clearway Restoration we know how important it is to locate all areas left moist and to make sure they too are dried out. Leaving trapped moisture will inevitably lead to mold buildup which may have serious health risk implications. Clearway restoration techs will utilize moisture locaters, such as ones based on infrared technology, to spot temperature differences which indicate moisture. Any moisture located will then be eliminated by all means necessary, including some dismantling if such action is called for. An important aspect of restoration in general is wearing the appropriate protective clothing. 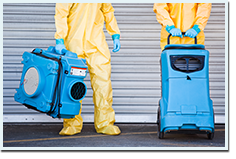 When you call on Clearway Restoration to provide you with water damage restoration you will notice that our techs always use all the protective gear necessary to ensure they do not expose themselves to short or long term risks.